Ear candling is an ancient and natural therapy handed down by many civilisations. It is believed that the ancient Greeks used ear candles, for cleansing and healing, however, the practice reached the modern world through the native American Indians of North Arizona. 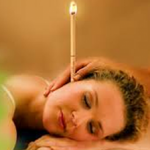 Ear candles were used traditionally by Shamen healers. The candles are still made today on the basis of the old traditional formular. Biosun Ear Candles (used by Alison) are hand made using a combination of the finest ingredients, including honey extract, pure beeswax, St Johns Wort, Chamomile, vitamins and minerals and essential oils. The above have anit-inflammatory and astringent properties they also assist with the relieve of mental stress, anxiety and nervousness. tinnitus, headaches, veritgo, glue ear, sore throats, sinusitis, snoring post diving/flying pressure, balance problems and many more. A candle is inserted gently inside the ear canal creating a sealed vacum, the candle is then lit causing (a chimney effect), the vapours gently massage and slip through the ear drum into the eustation tubes connecting the ear, nose and throat during which time the herbs etc. are able to heal and draw our impurities. (Impurities and deposits can be found in the candle wax resdue after removal from the ear and can work their way to the surface 24-48 hours after a treatment. The treatment is finished off the a gentle massage of the face to help the drainage from lymph nodes either side of the ears and around the face. For Guild Accredited training courses please also call me on my mobile 07717 311204.